You must have noticed that I like to review quilting books. To be featured on my blog a book must generally contain projects that are intriguing due to their design (interesting play between block and color, intricate [or very simple!] composition, etc), which might present a different take on a traditional block or quilt design, or which demonstrate new techniques or trends. I've just found a great quilt book with amazing contemporary quilt designs for every room of your home. 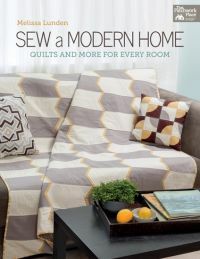 True to the modern quilting trend, Melissa Lunden's book Sew a Modern Home has 19 projects with designs that feature simple lines, striking color combinations, and clever use of graphic and geometric prints to create interesting patterns. 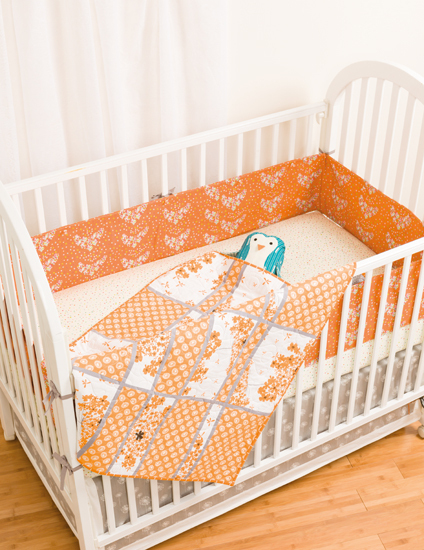 However, her projects can easily be adapted to a more traditional look as you vary your colors and fabric choices. Look at the cover quilt - I had to do a double take when I realized that pattern was pieced (at first I though it was just yardage of fabric turned into a quilt, because the yellow lines are so narrow!). The pillow on the left is particularly noteworthy as its design hinges on the fabric print chosen and how it was cut. I love the nursery ensemble shown at left for its design and departure from the traditional pink and blue. 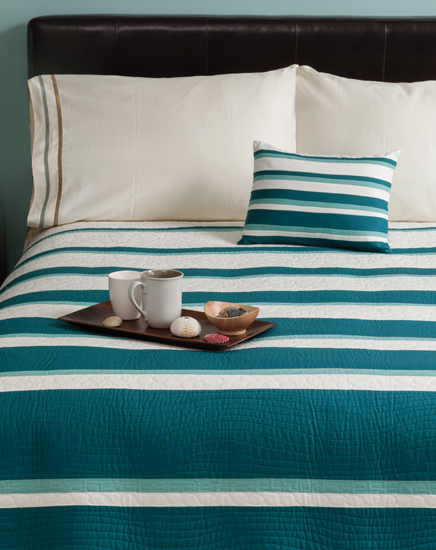 I started to think of alternative color combinations that would be just as pleasing, such as teal, brown and white (teal is my daughter-in-law's favorite color). Did you notice the Plushie Penguin? Melissa also has instructions for a cute OctoPlushie, with tentacles which are perfect for little hands to hold. Flying geese, a block often featured in modern quilt designs, are stunning in Lunden's color palette. Her minimalist folded napkins would likely become a conversation piece at your dinner table. Sew a Modern Home has clear instructions for every project, as well as tips to help make each project your own. The basic instructions section walks you through all the steps you need to follow to make quilts so, if you are a beginning quilter, you will learn all you need to know in order to complete the projects. Stop back on Thurday for the 4th block of our City Girl Sew Along, which is a simple applique block. I wish you lots of quilting fun today!